Photo by Anne (CC BY 2.0). Dark Opal basil was bred at the University of Connecticut in the 1950s by John Scarchuk and Joseph Lent. It is an open-pollinated variety meaning you can save the seeds from one season to the next and they'll grow true to type. Dark Opal has a sweet, mild anise flavour and can be used instead of regular green basil in any recipe that calls for it. The purple leaves of Dark Opal are rich in anthocyanins and can be used to create dishes with interesting colour variations from the norm. You could make a purple pesto or infuse salad dressings with a vibrant crimson colour by adding finely chopped Dark Opal basil leaves. The leaves are also great when added whole to salads or scattered liberally on top of pizzas before baking. Dark Opal basil grows best in full sun but it will also tolerate light shade. 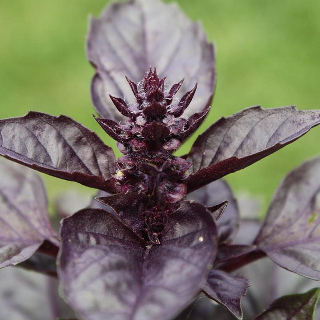 The more sunlight your Dark Opal basil plants receives, the darker and more rich in anthocyanins the leaves will be. Make sure that your soil is free draining, create a raised bed for growing basil if your soil is too compacted or heavy with clay. Dig lots of organic matter, well rotted manures, worm castings and compost through the soil prior to planting and you'll be rewarded with healthy, happier plants. Fertilise your basil plants monthly with a organic liquid or pelleted fertiliser. Pinch off the growing tips of your basil plants to encourage them to create more side shoots and become bushier. Basil will produce few leaves if they are left to go to flower, so pick off any flowering shoots before they fully form to prolong the life of your basil plants and increase the harvest period. Basil plants don't like dry conditions so water regularly and mulch around plants well to retain moisture, keep their root systems cool and reduce competition from weeds. This variety of basil is suitable for container growing. Sow Dark Opal basil seeds from September to December in cooler and temperate regions of Australia. In subtropical regions of Australia sow Dark Opal basil seeds from August to December. In tropical regions of Australia you can sow Dark Opal basil seeds all year round. Sow Dark Opal basil seeds 6mm deep into the soil, spacing or thinning plants to about 20cm apart to allow them room to grow. Dark Opal basil seeds take between 7 and 10 days to germinate once sown. Dark Opal basil takes between 11 and 12 weeks to produce good quantities of leaves, although you'll be able to harvest shoot tips and individual leaves before then as they are needed.